I seldom get the opportunity to stay in the city, and photograph all the different types of light. 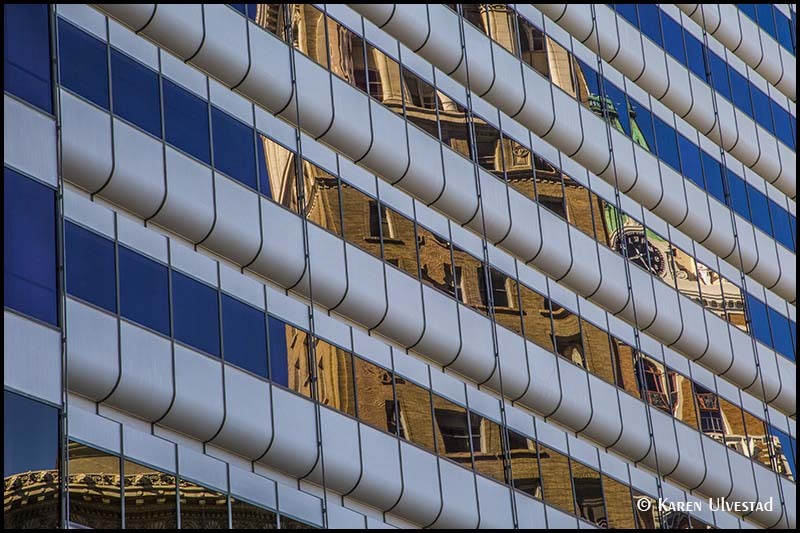 Composing in the city is similar to Landscape photography, but the lines are more linear and defined. I find that it give me a different perspective to take back to the natural world I love to document. The shot above is an example of “outside” the box composing. This long exposure was taken through the hotel window at F22. The yellow cast to the image is the temperature of the street lights. The “spotting” effect is the dirt on the outside of the window. All this together creates a “grunge” feeling for the photo. 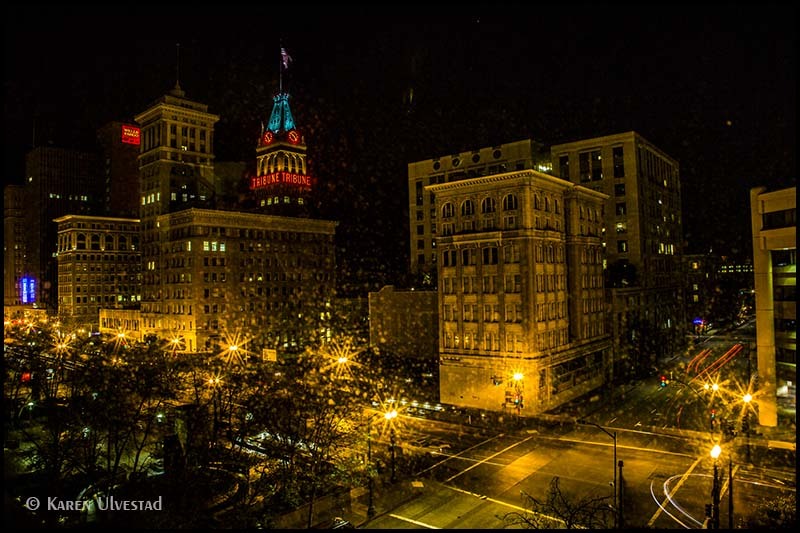 Photographing the city at night, illustrates the different temperatures of light. The colors that look “true” are most likely daylight balanced fluorescent or LED. The yellow is tungsten or incandescent. The green cast is most likely regular fluorescent. Daylight brings another look to the buildings. I love the reflections in the modern glass buildings, mixed with the historical brick buildings. The strong use of diagonal line in the above photo guides the viewer’s eye through the picture. Diagonal lines add a feeling of motion to a static image. The reflection in the glass is the buildings across the street light by direct sunlight. I used a polarizing filter to enhance the blues, and was careful not to eliminate the reflection in the glass. Cities are filled with contradicting images and ideas. The above image is bullet damage to a 1/2 inch glass window. I like the story it tells of prosperity (see inside the building) and the reflection of the historical buildings across the street. This building was a corporate headquarters, and is was situated in an area of diverse stories of prosperity and decline. 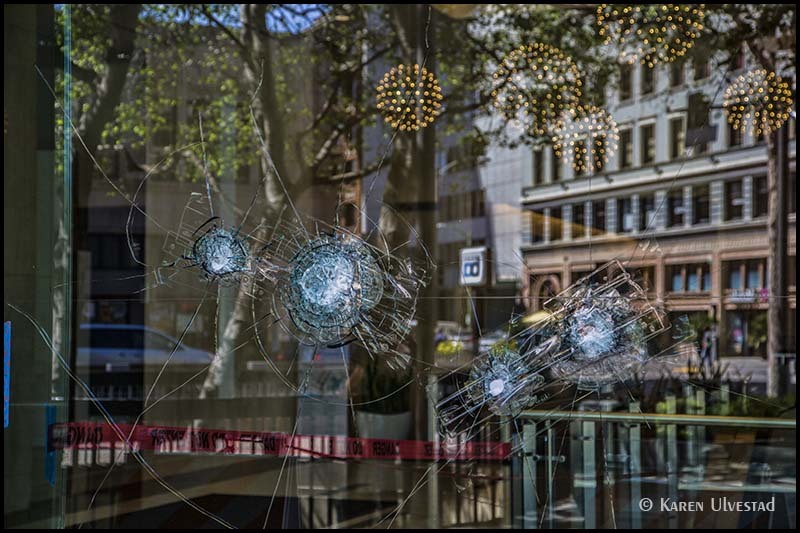 The lines in this image are the arrangement of the bullet damage which are taped, and the diagonal lines of the buildings in the reflection. 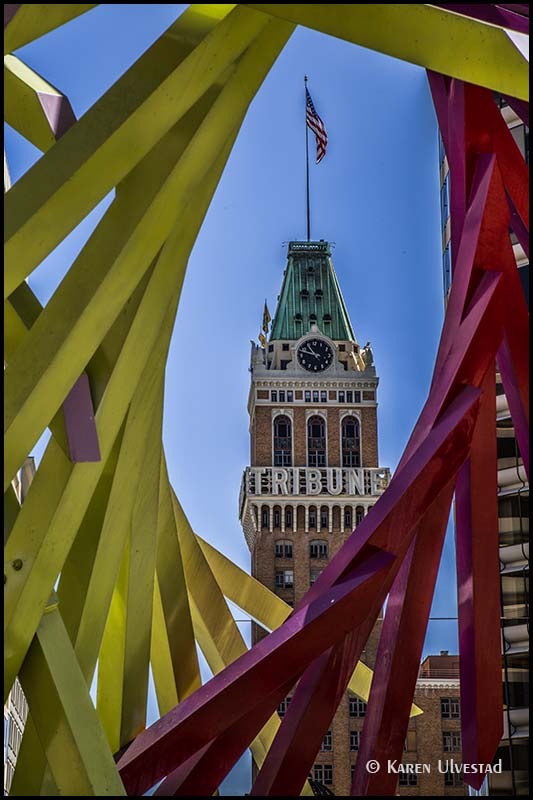 The image below is a combination of a sculpture and the Tribune tower. I intentionally framed the tower with the brightly colored sculpture, and used a large depth of field to bring out sharpness in the foreground, mid-ground, and background. The first photo is stunning! Great work on capturing the city lights. Makes a concrete jungle look magical.